We've all heard that lemmings jump into the sea every year, drowning themselves because they are just following the herd. Except they don't. That's actually a myth invented for a Disney wildlife documentary, and it has blinded us to the truth about the weird lives of lemmings for decades. Lemmings are small, fluffy rodents that live mostly in the Arctic, thriving on the snowy tundra in places like Norway, northern Alaska, and Siberia. One of the great mysteries of lemmings is their odd population cycle. Like many rodents, their population expands every few years. But among lemmings, this explosion is dramatic — every few years, their population grows 100 to 1000 times larger in just one winter season. These events are often called lemming outbreaks because the rodents will migrate all over the place looking for food, even swimming across rivers and lakes to find plants and mosses to eat. Occasionally, they fall off rocks or cliffs as they scramble to find sustenance. Then, just as abruptly, their population crashes into near-extinction. For centuries, legends have formed around this odd cycle. Where do the lemming outbreaks come from? And what happens to all of the rodents afterwards? One popular myth was that they all just jumped into the ocean and died. Back in 1958, Disney was making a documentary about Arctic wildlife, White Wilderness, and decided that legends were as good as facts. So they brought in a truck full of lemmings to throw into the Arctic ocean. First, they put a bunch of the lemmings on a big, snowy turntable to film them "running" toward some cliffs. Then they shoved hundreds of these poor little guys over the cliff, into the ocean, where they (not surprisingly) drowned after trying to swim. Here is the original clip from White Wilderness, below. Knowing that these lemmings were deliberately shoved over the cliff and drowned makes this pretty upsetting, so be warned before watching. This film is what gave rise to many sayings about how lemmings follow the herd no matter what. And of course it's misled many people into thinking that lemmings commit mass suicide on a regular basis. The reality is actually just as mysterious as the legends. Lemmings are one of the only true Arctic rodents, and they prefer to reproduce in winter. During especially cold winters, or at chilly high altitudes, they will have far more offspring. Lemming population booms, according to researchers' observations, are dependent on icy cold weather. There are likely a few reasons for this, but most important would be that they've adapted to cold weather systems — when there's a long, intense winter, these little guys breed like crazy under the snow. As for what causes the lemmings' massive population crash — we still aren't completely sure. We know for certain that it's not mass suicide, but we also know that more adult lemmings die during outbreak years. So the population is huge, but a lot more of the animals are dying than during a typical year. An arctic fox plays with the lemming it has just caught. Photo by Sergey Gorshkov. This high lemming death rate could be because the expanded population suffers food shortages, or it could be caused by predators chowing down on these tasty creatures that are suddenly everywhere underfoot. Another possibility is that there is a lot more infanticide because so many males want to mate with females — and killing a female's brood will make her ready to mate again. Because the most intriguing part of the lemmings' lifecycle takes place under the Arctic ice, it's been hard to observe them and find out what's driving their population flux. But one thing is for certain. With the Arctic warming, there are likely to be fewer and fewer lemming outbreaks. And nobody is really sure what that will do to the typical lemming population. 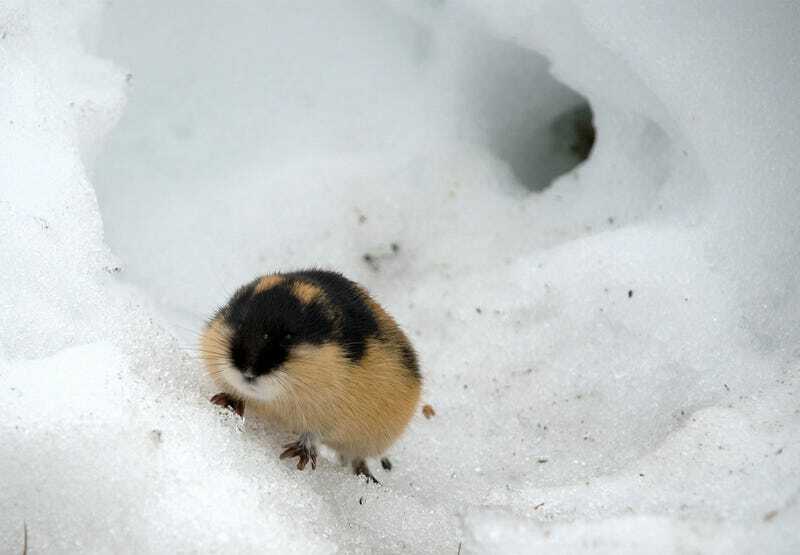 For now, lemmings remain a strange and adorable mystery of the tundra. Sources are linked in the text.